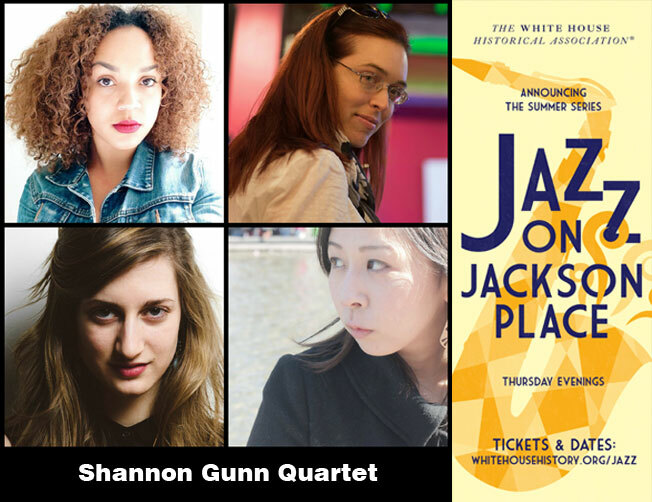 The White House Historical Association is pleased to announce the second performance of the 9th season of Jazz on Jackson Place, featuring live music in our historic Decatur House courtyard. A Washington Post Going Out Guide “Editor’s Pick,” this summer series is not to be missed. This Thursday, July 9 evening performance, 6:30p.m.-8:30p.m., includes live music, delicious hors d’oeuvres, and libations provided by Federal City Caterers. Enjoy the ambiance of historic Washington just steps from the White House and tour the restored historic Decatur House. The $30 ticketed admission includes entertainment and food/beverage. Big Band leader Shannon Gunn comes to Jazz on Jackson Place with her quartet. Stellar New York-based artists Miki Yamanaka on piano and Adi Meyerson on bass, and DC-based artist Savannah Harris on drums promise to offer an exciting evening under the tent. Shannon Gunn is the leader of the all-female big band The Bullettes, and appears regularly with the Bohemian Caverns Jazz Orchestra. A graduate of Michigan State and George Mason University jazz programs, Shannon is playing a pivotal role in the DC jazz scene. Tickets may be purchased as a full season package or for an individual event. Future dates and performers include Thursday, August 6 Firm Roots. These summer evenings sell out, so be sure to get your tickets today.